Caramel Wings: Review: Asparagus Festival at Sofitel, Bandra Kurla Complex, Mumbai. 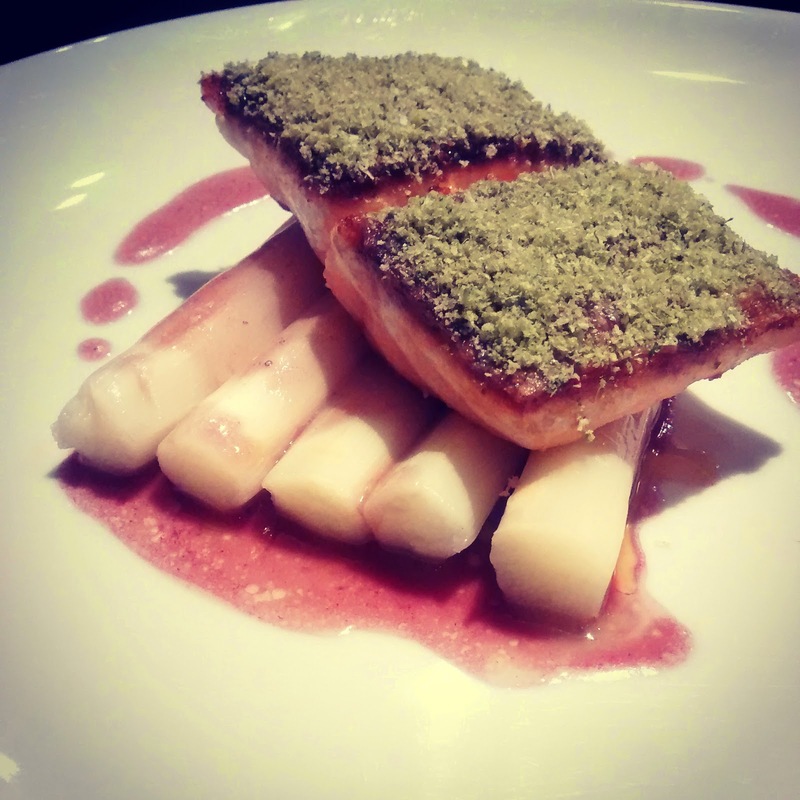 Review: Asparagus Festival at Sofitel, Bandra Kurla Complex, Mumbai. Every year, on the 1st of January, I write a check list. It consists of 10 items. I evaluate myself on the basis of the same, on the 1st of January next year, which is when I make a new check list. One item that has been on my check list for the past 3 years is wanting to learn a new language and finally this year I took it off my list, giving up hope that I will ever get around to learn a new language. In my universe, things have a funny way of finding me when I give up on them, and just yesterday I attended my first class for learning conversational French language. I am so excited! The class was fun and interactive, and I got to learn so many new things! I am lucky that I got the company of my two beautiful friends, Anita and Ramya. We have been spamming each other's messages with Bonjour/Bonsoir and counting numbers from Zéro to Trente! I could not have asked for a better day to visit the Sofitel chain of hotels, and be greeted with 'Bonsoir, mademoiselle' every place I went. 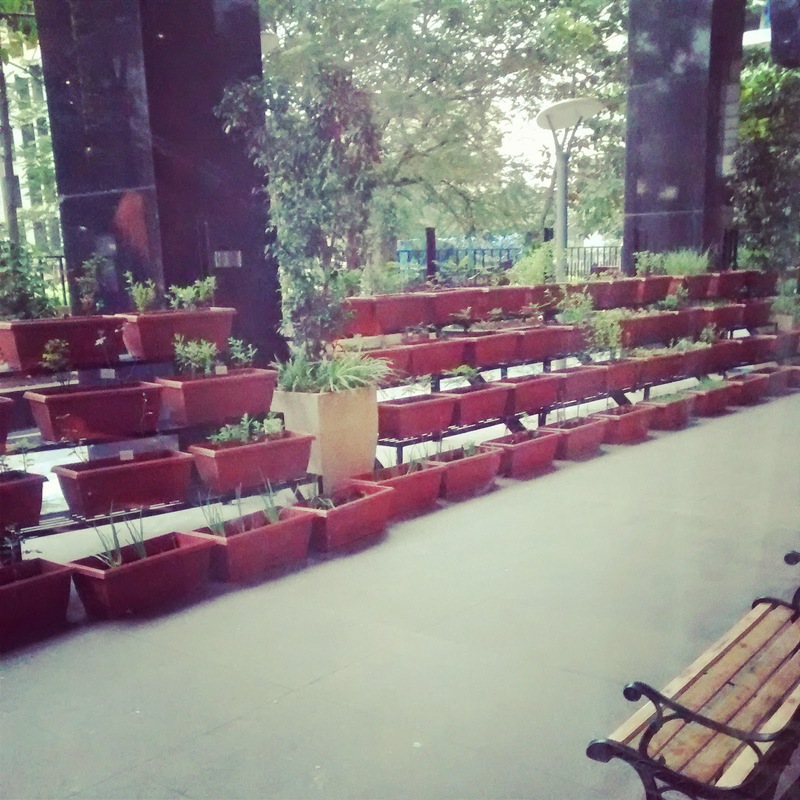 I have always been a fan of their modern decor, and their brand new addition of a mini walk way with potted herbs is a fragrant and beautiful idea, which will grow into a quaint al fresco area for Sunday brunches, what with freshly picked herbs going into omelets! Quelle magnifique! 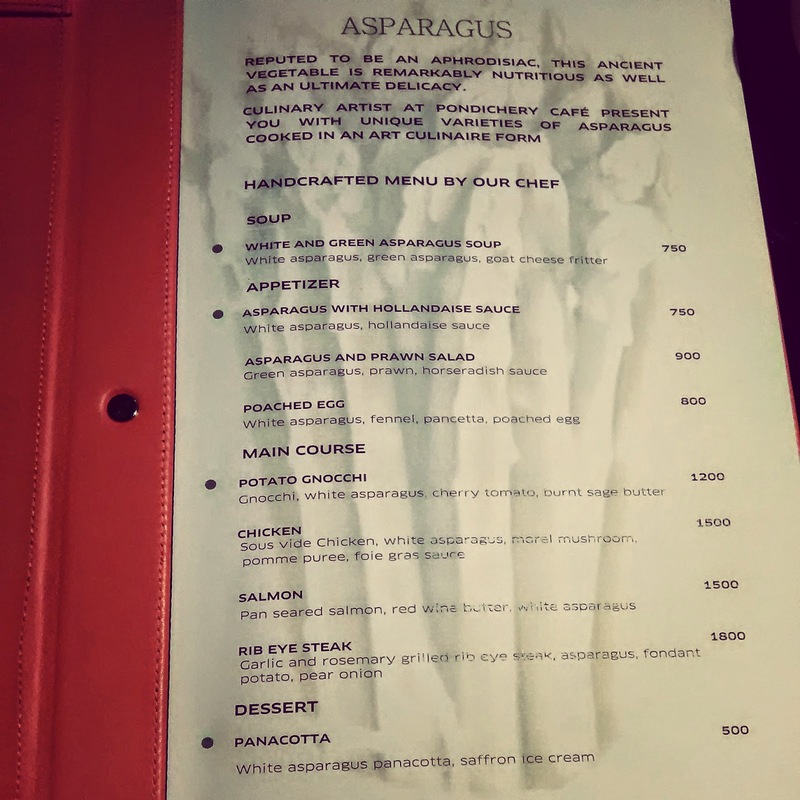 We arrived early for our dinner reservations, so we could take our time and try out as much as we can of their new Asparagus festival menu, which is said to be an Asparagus celebration. I am a huge fan of this spring vegetable, and I love the beautiful stems with poached Lobsters to scrambled Eggs to being blanched and served au naturel, as a salad with some salt, pepper and a dash of Olive oil. The Asparagus used for the Sofitel festival is imported from Peru and costs upto an exorbitant Rs. 2,000 per kg, but I fail to understand why is the local produce not celebrated more. I guess the imported goods is why the menu looks quite expensive too. 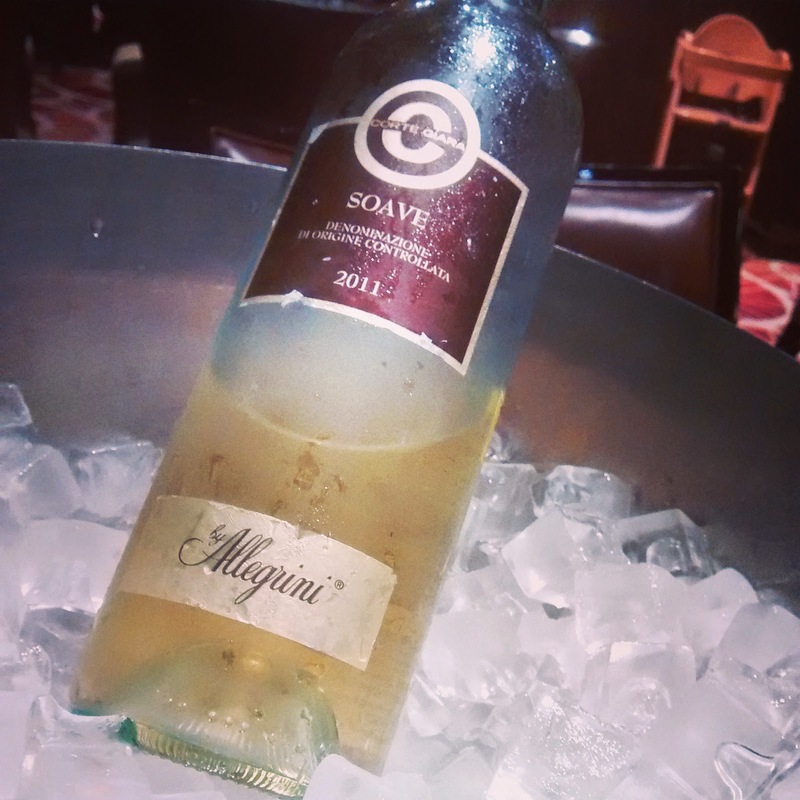 A good meal was started with a great Italian Wine, the 2011 Allegrini Corte Giara Soave. My rookie wine drinking date for the night also loved the bright aromatic flavours, as did I. Lovely recommendation from the restaurant manager, Sagar. I do believe that Asparagus is highly underrated, and a true celebration for me would be inculcating it into Indian dishes too. On that note, I must try out an Asparagus Korma. Anyway, on to the meal! 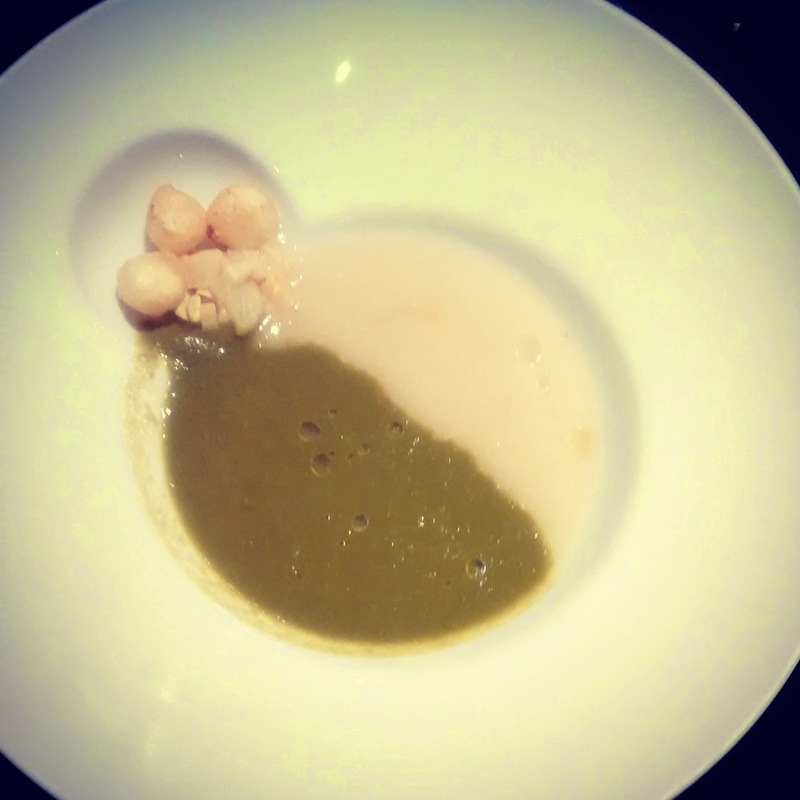 We started with an Asparagus soup that was served with pieces of chopped Asparagus and the croutons were replaced by little bits of Goat's Cheese deep fried to crispy perfection. I loved that the soup was the perfect beginning to our meal, and the White Asparagus soup was unbelievably creamy yet light at the same time. The portion size was just the right amount to set the tone for the meal to come. Next was the Asparagus and Prawn Salad. 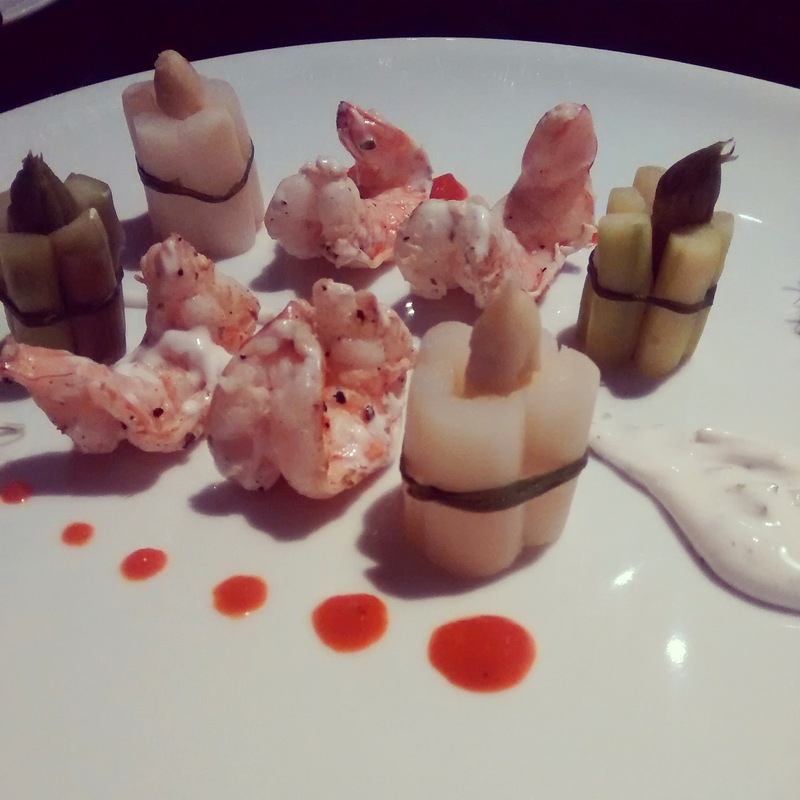 Tender Asparagus stems were served along side plump prawns tossed in a tartar-like sauce, and served with a Red Pepper Puree and some Alfalfa sprouts. Simple and clean flavors that all came together, albeit I did feel that the portion size could have been larger. Poached Quail Eggs with Asparagus, Fennel and Pancetta. What followed was the dish that I would pay the price for. 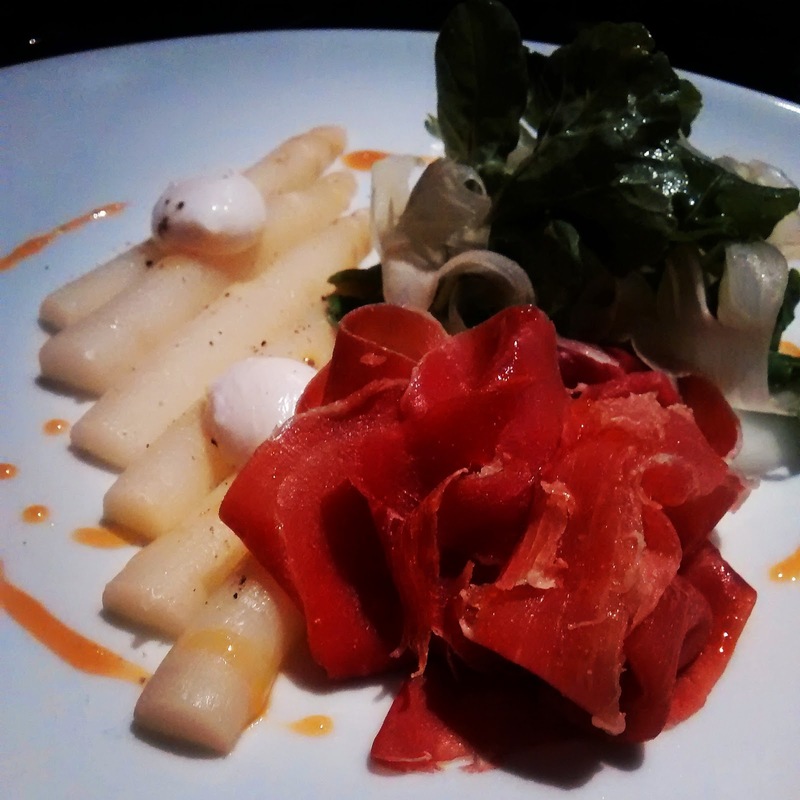 Quail Eggs gently poached to perfection, served over a row of White Asparagus, served with Rocket leaves and Fennel shavings and a mound of Pancetta, all finished with a drizzle of Honey. I know you can imagine it. I know you can taste it. This dish was pure genius. Highly recommended! 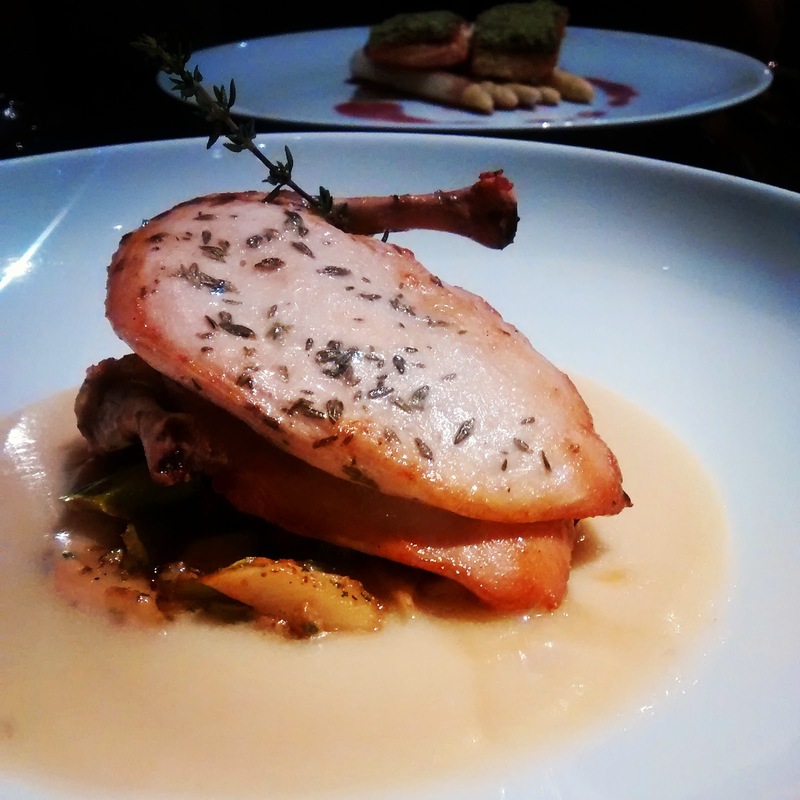 Sous-vide Chicken with Asparagus and Mashed Potato Foie Gras Puree. The main course was a bit of a disappointment. We started with a Chicken Sous-vide that was finished in a frying pan with thyme, and served over a medley of Asparagus and a Pomme et Foie Gras Purée. Please don't blame my judgment on my loyalty towards Master Chef Australia, but I do not get why a sous-vide chicken had to be finished in a frying pan. The meat was overcooked. The purpose of a sous-vide is to cook the chicken to tender perfection so that your knife would glide along the meat, but I did have to work on the Chicken Breast, quite a bit. On the contrary, the Asparagus medley and the Pomme et Foie Gras Purée was so fantastic, that the plate went back with nothing but the two Chicken Breast pieces... Okay, one and a half. Pan Seared Salmon with Asparagus and Red Wine Butter. We went on to trying the Pan Seared Salmon which was served over... you guessed it right, a row of Asparagus, and Red Wine Butter. I honestly did not care for this dish. I would give this a miss. Gnocchi with Asparagus, Cherry Tomatoes and Burnt Sage Butter. 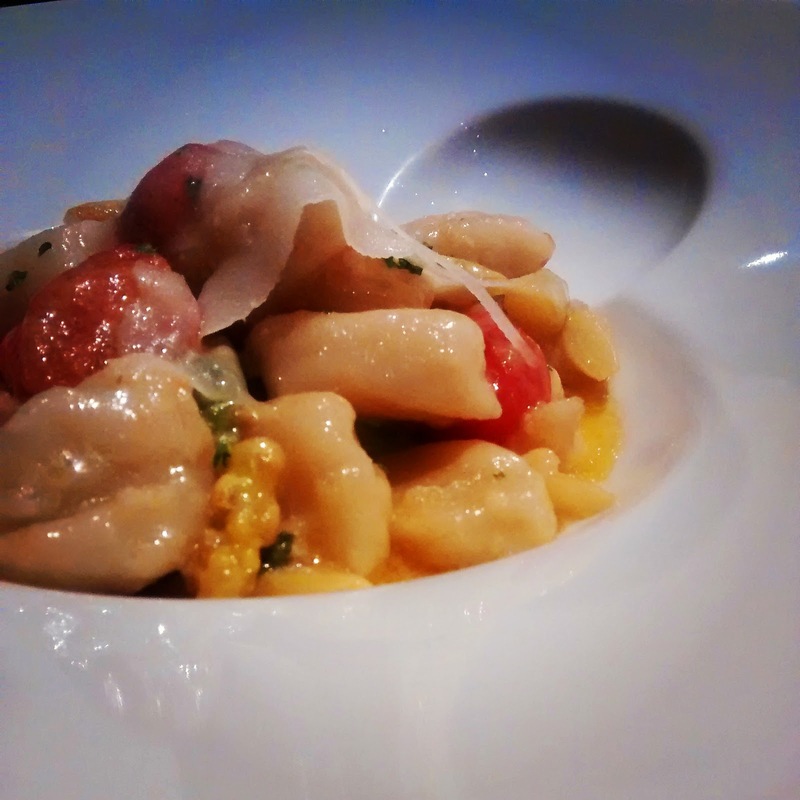 I requested the chef to send me a portion of Gnocchi with Asparagus, Cherry Tomatoes and a burnt Sage butter sauce. Now, I am not a Gnocchi connoisseur but I do know that something is horribly wrong if the Gnochhi bits are sticking to the roof of my mouth, let alone it melting completely at the first bite. It was too doughy, and I did not care for anything on the plate except the blanched Cherry Tomatoes. Asparagus Panna Cotta with Saffron Ice Cream. Dessert was an Asparagus Panna Cotta served with a Saffron Ice Cream and a Chocolate cookie dust. 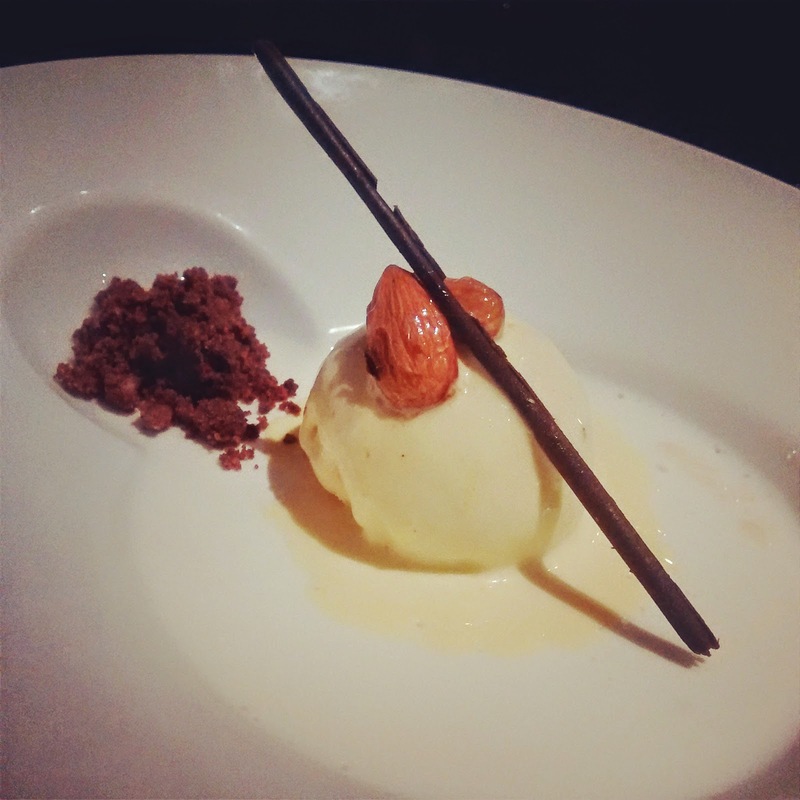 The Saffron Ice Cream was pure genius, with just the right amount of sweetness and a great satiny texture. It was also visually appealing with the sensual black specks of Vanilla laced all through it. I wish I could say the same about the Asparagus Panna Cotta. It was overtly gelatinous. 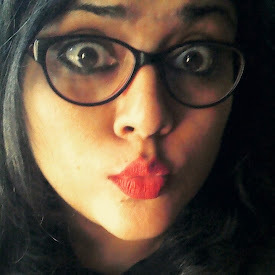 Next to the Saffron Ice Cream, it tasted like nothing. If you have to chew a Panna Cotta, you know there is something not so right about it. Requesting their team to fix this as soon as possible. I wish the Sofitel team could have been more innovative about Asparagus than just placing rows of it on to the plate. To celebrate an ingredient in all its glory is to provide your diners with a unique experience (especially at that price) right from roasting to blanching to trying to incorporate it into some other ingredient. I have watched the Chef movie, and I do sympathize with the Chefs if their hands are tied thanks to the management, but I just wanna say that diners, at least from Mumbai, are always up to trying something new, with a WOW factor. This is strictly my opinion. I congratulate the team at Sofitel who did manage to come up with a great spread nonetheless, and hope to see better execution! Thank you so much for the invitation, I am truly honored! I shall forever remain a fan of your lunch buffet as well as the Sunday brunch! The Asparagus Festival is on till August 10, 2014. Labels: asparagus, Chicken, Dessert, foie gras, food review, gnocchi, Herbs, ice cream, panna cotta, Review, salad, salmon, sofitel, Soup, sous-vide, thyme, wine. This review gives me a clear picture of what is a hit and what is a miss. 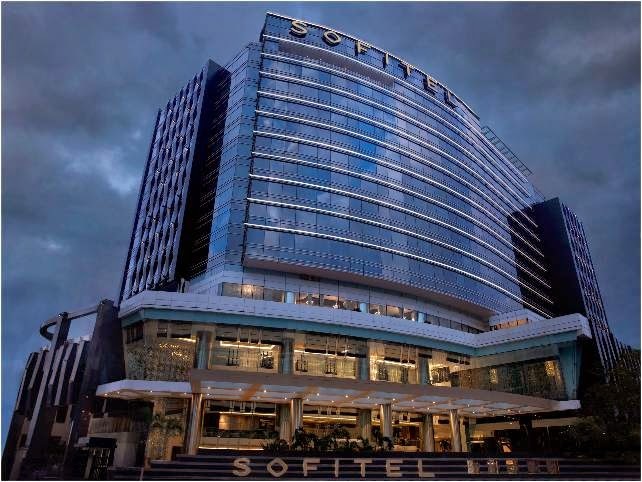 .and thanks to you I shall be trying Sofitel's buffet soon. ..